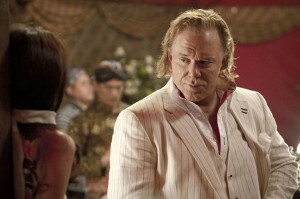 Mickey Rourke terrorizes in Java Heat. Mickey Rourke (Immortals) and Kellan Lutz (Arena) star in the action thriller film Java Heat, wherein a well-meaning American’s best intentions go horribly awry when he gets into some serious trouble in Asia. Following a terrorist attack in Indonesia that killed the country’s beloved Sultana, headstrong American Jake Travers (Lutz) suddenly finds himself in the center of the already tense conflict between the West and Islam. Lost among labyrinths of religious, political and cultural havoc in the world’s largest Muslim nation, Jake teams up with Muslim detective Hashim (Indonesian star Ario Bayu). The unlikely duo embark on a treacherous manhunt for the attack’s real perpetrator, a new breed of klepto-terrorist (Rourke), who is even more twisted and terrifying than the Jihadist terrorists he hides behind and who’s plotting to steal the royal treasury Jake must learn to abandon his thirst for vengeance in order to stop the mastermind from attacking again. Shot on location in Indonesia, the movie is directed and co-written by Conor Allyn. A 2013 R-rated film that’s essentially premiering on disc following a handful of screenings (and a DVD rollout in Europe and Japan), Java Heat immediately reminds me of those straight-to-tape action-thrillers of the late eighties and Nineties—you know, the ones with Gary Daniels, Thomas Ian Griffith, Marc Dascascos, Jeff Speakman, Christopher Lambert, Michael Dudikoff, and so on and so on and so on….